To answer that question: just go. No seriously, just go. One minor detail: Lisbon has hills. Like a lot of hills. So definitely bring your baby carrier. And a lightweight stroller. Tip from Larey. You’re welcome. 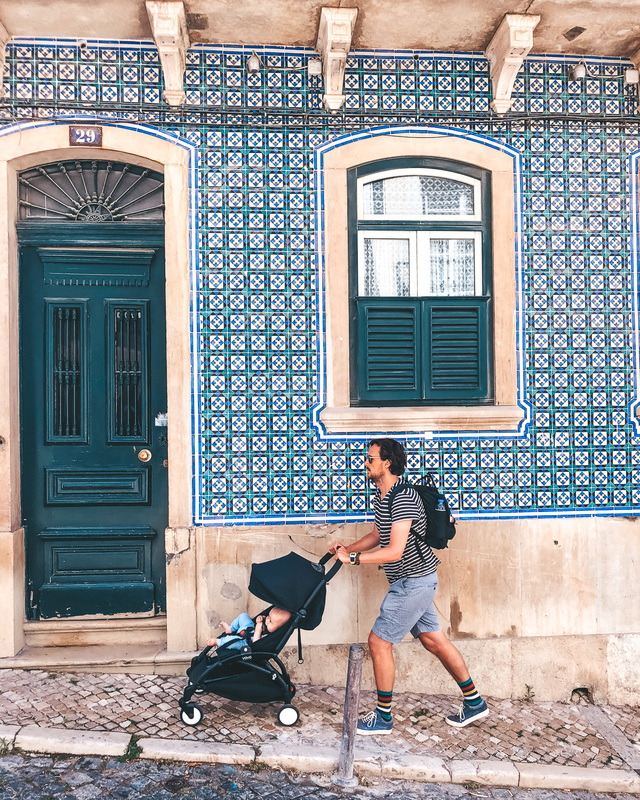 Okay, here are a few more tips to make the most out of your Lisbon trip with a baby. 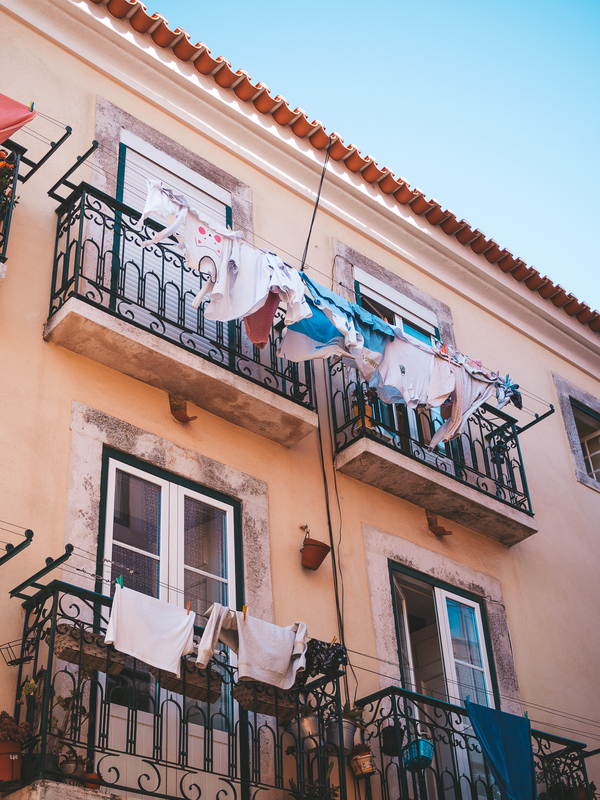 I know Lisbon has a lot of fantastic (and affordable) hotels but if you’re traveling with a little one the best thing you can do is to skip all of them. We found an excellent apartment in a fantastic location, for an amazing price. Yes, all those adjectives are necessary because that’s how much I loved our Airbnb. It was spacious, light, clean, modern, and the famous Lisbon tram stops pretty much in front of the building. The separate bedroom made sure we could enjoy some port while the kiddo was in bed, without the need for whispering and tiptoeing around. This is where your baby carrier comes in handy. No, strike that. This is where your baby carrier is essential. 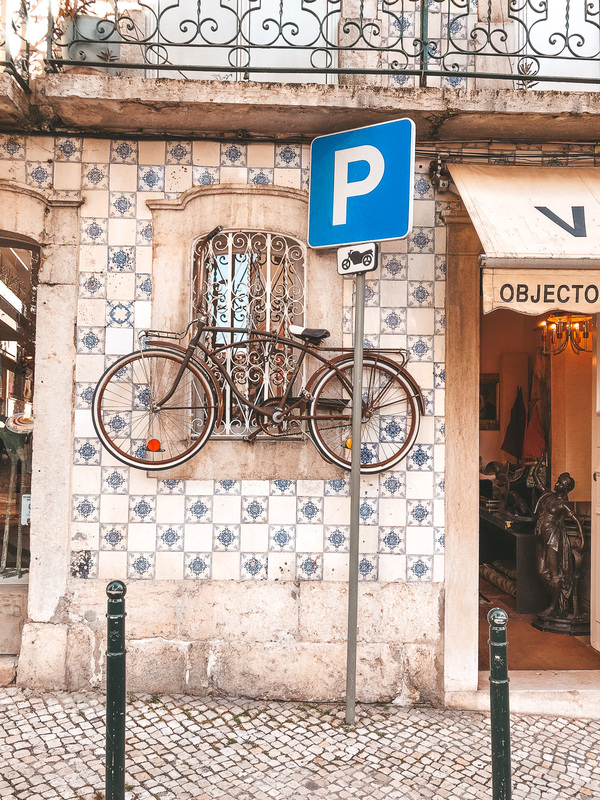 The little streets and alleys of the oldest neighborhood in Lisbon are best to explore on foot, and without a real plan. 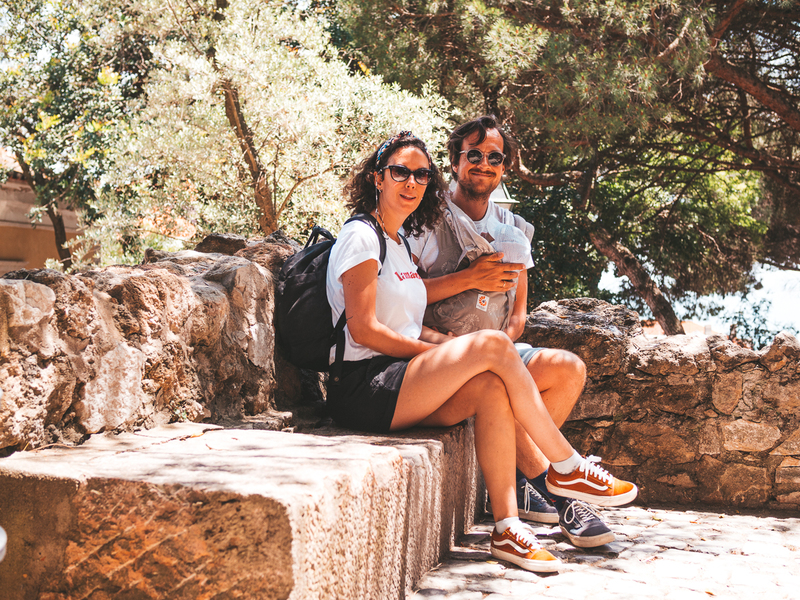 Okay, I do recommend adding the Castelo to your itinerary (see below why). And by wandering around a bit, we found the cutest little restaurant with the best freshly grilled sardines. Winning! I don’t think I can even tell you where it is, just look for the place with the friendly guy grilling sardines. Sorry, that’s all I got. 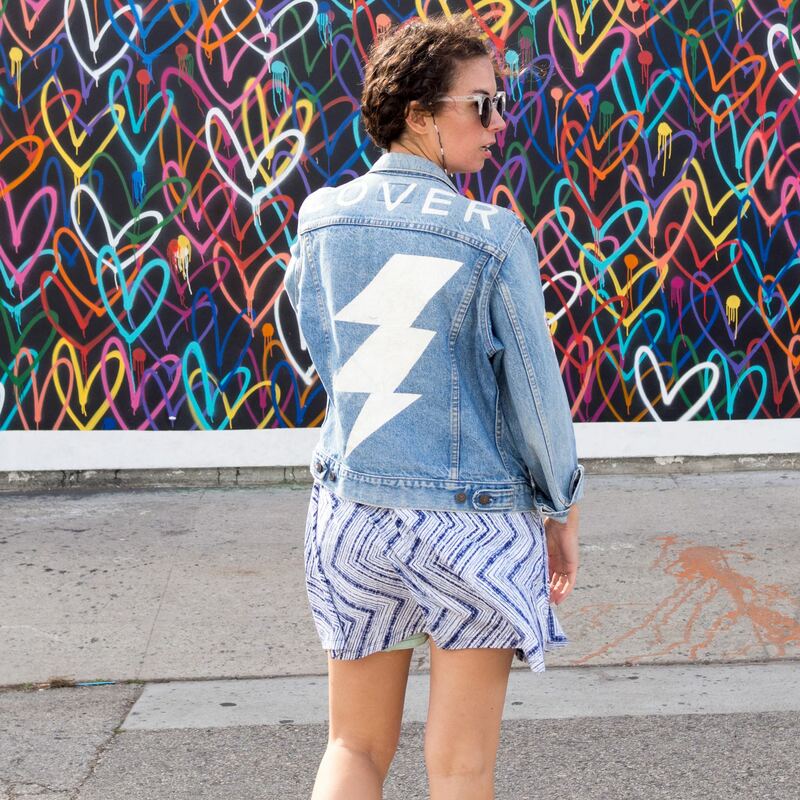 Mostly known for its bars and cafes, this neighborhood is another perfect place to just get lost and immerse yourself in this beautiful city. The houses, the tiles, the old doors, laundry hanging from the windows. 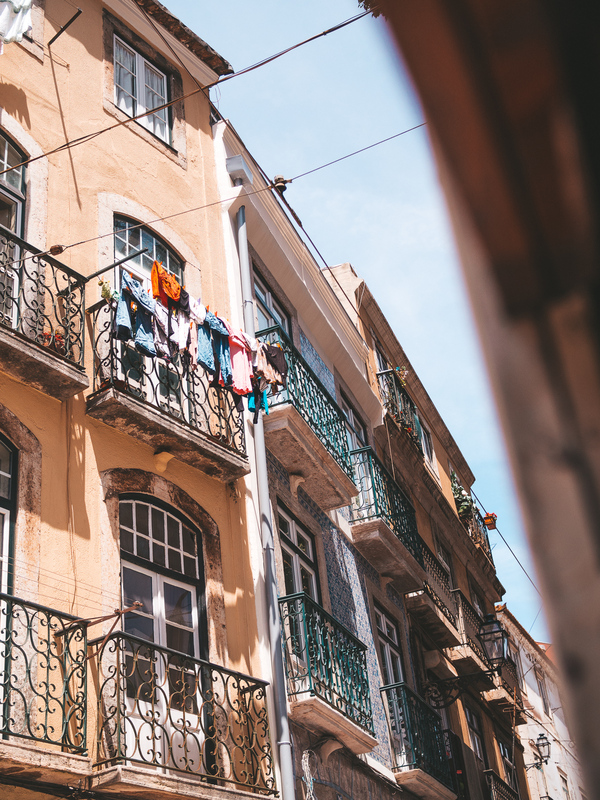 It’s your Lisboa dreams coming to life. 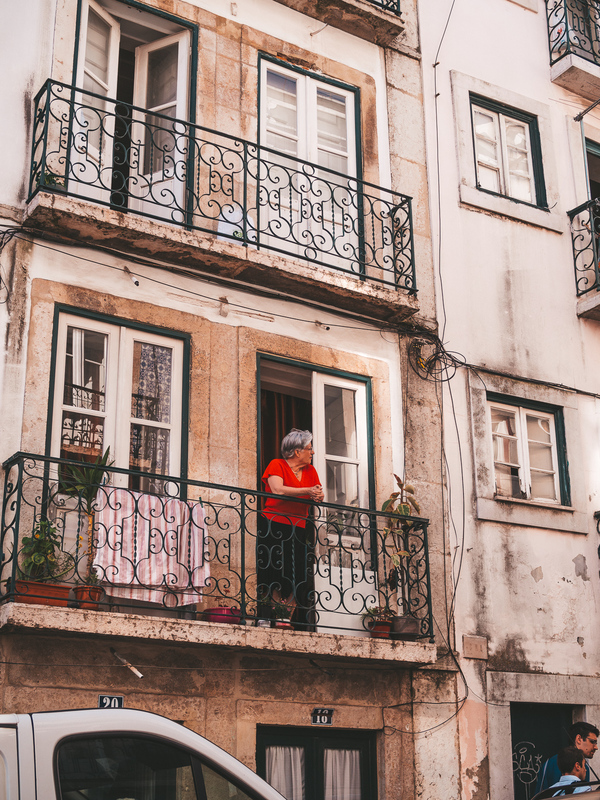 I honestly think I snapped a photo every few minutes while exploring Lisbon because the houses are so ridiculously beautiful. I’m a sucker for old – almost run down – building, especially if they are covered in colorful tiles and adorned with iron balconies and old wooden doors. And there’s no shortage of those things in Lisbon. This beautiful balcony almost feels like an observation deck. 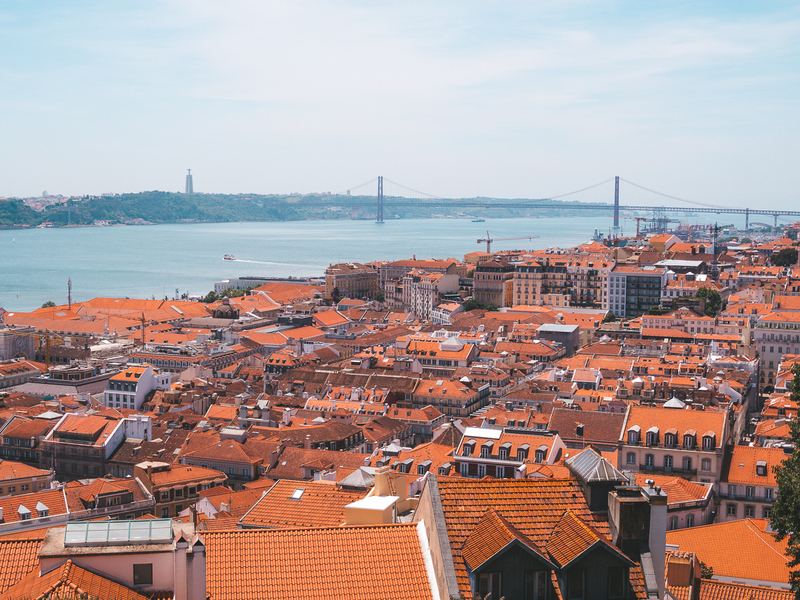 You have an amazing view over Alfama and the Igreja de São Vicente de Fora. It’s also close to another famous viewpoint in Alfama: the Miradouro de Santa Luzia. 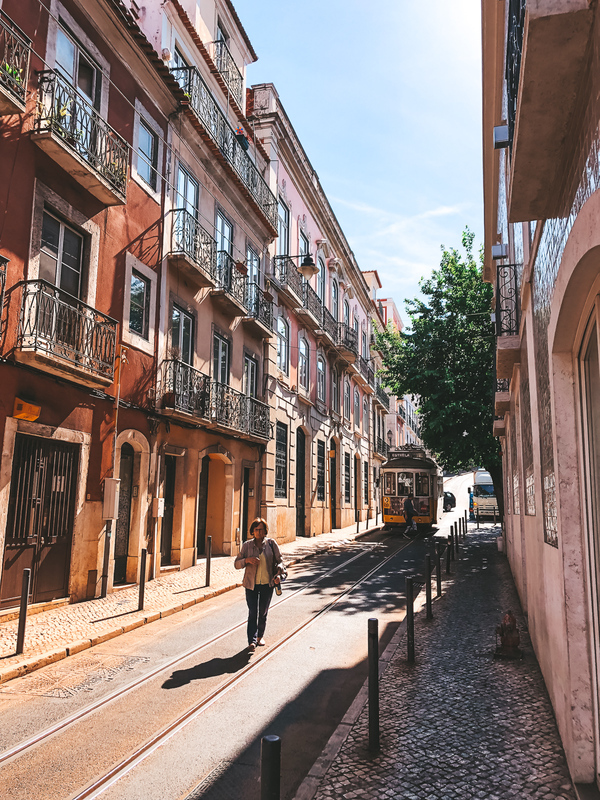 Both are close to the Castelo, and the E28 tram stops here so you don’t even have to work hard to enjoy it. Although you probably have to share these two spots with a few others, it’s well worth a stop. 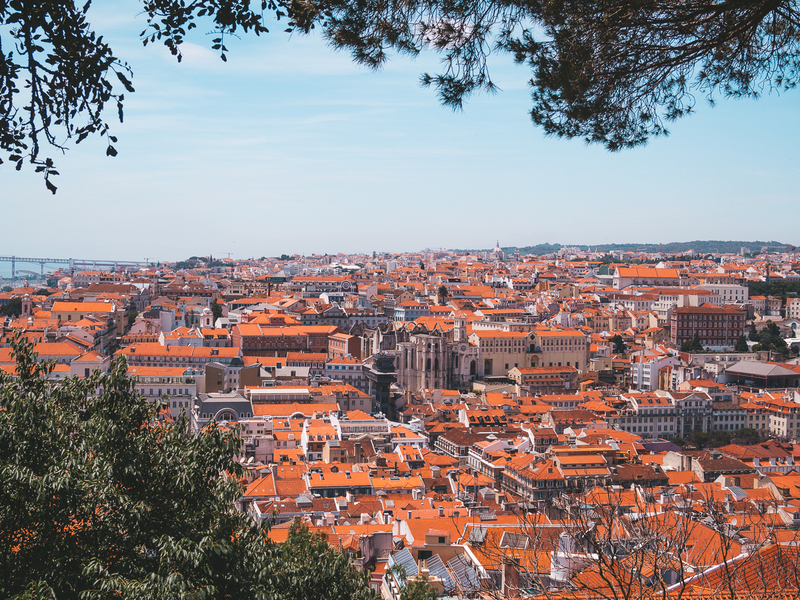 Not only is this a really cool castle to roam around, it also has some amazing views over Alfama and pretty much the rest of Lisbon. Pro tip: grab some wine from the wine truck for a pretty sweet sunset cocktail hour. Okay, I’ll admit that we thought this Bairro Alto bar was a little bit overhyped, but you can’t beat the views. And if you manage to actually order a drink you can have a really good time here. But with a baby in tow, we didn’t think it was worth the wait. 10 points for the view though. 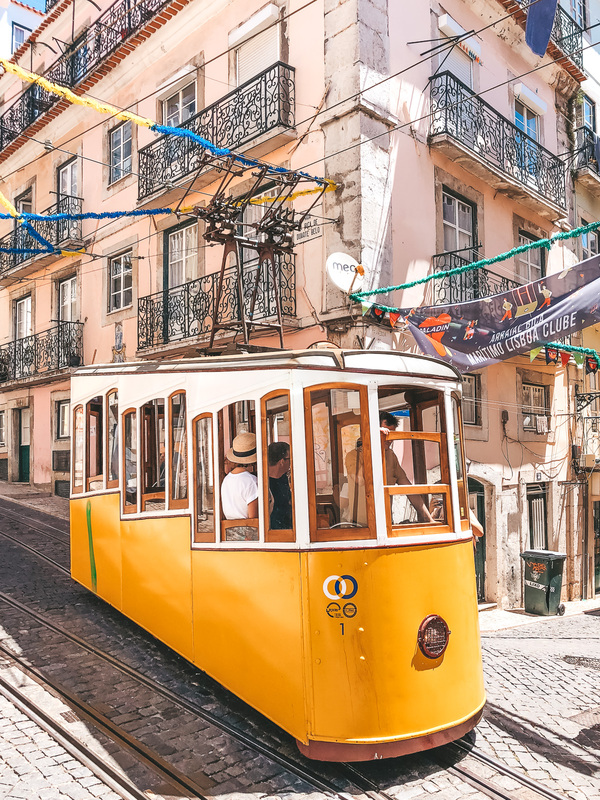 Lisbon is world famous for its iconic trams, and the most scenic route is the E28. 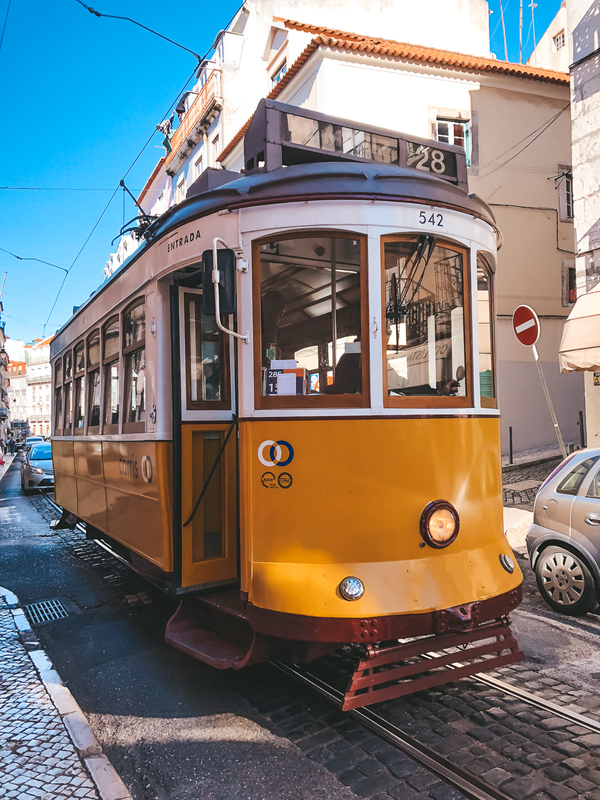 If you’re visiting Lisbon on a weekend get ready to feel like a sardine in a can when you travel on the E28. Pro tip: hop on early in the morning and try to take one of the first (or last) stops on the route to maximize your chances of getting a (window) seat. 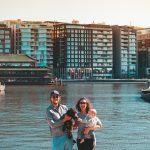 Luc really loved traveling on the tram, and we welcomed the chance to rest our feet with open arms. Did I mention Lisbon has hills? Yeah. Important to note: don’t, I repeat don’t, take the tourist version of the scenic tram (the red ones). You’ll pay waaaaay more money and you travel the exact same route. 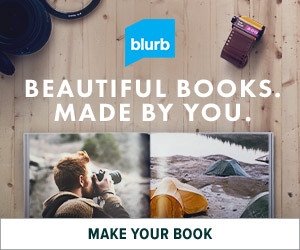 Just don’t. Save your money for some extra cocktails. Or pasteis (more on that below). 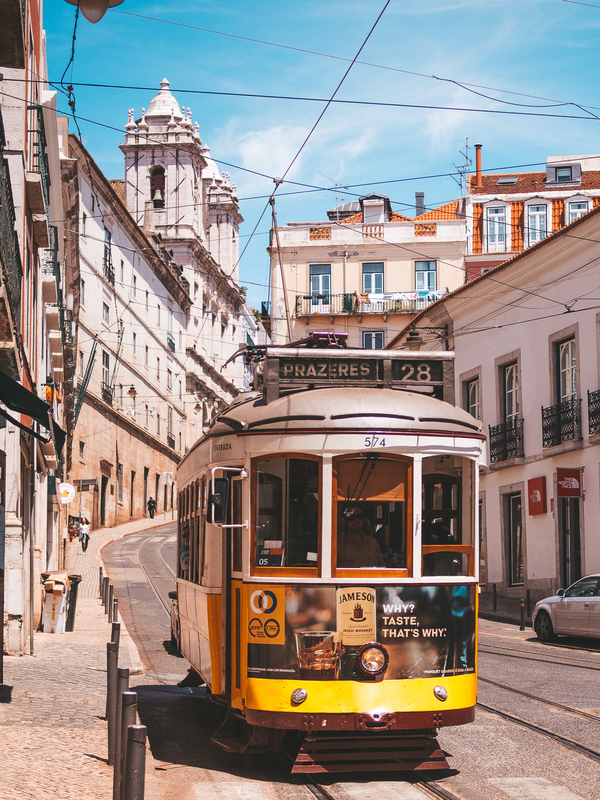 Although I loved traveling on the E28, my favorite form of public transport in Lisbon is definitely the Ascensor da Bica. 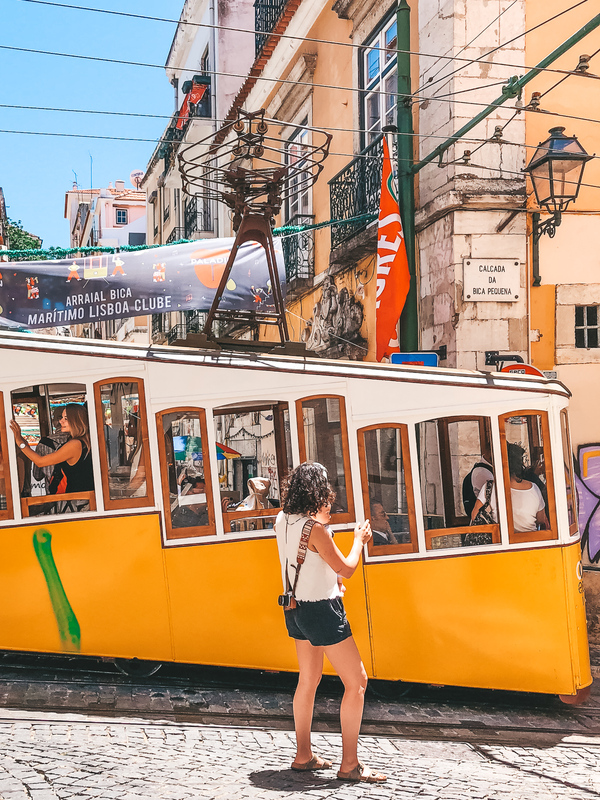 Technically not a tram but a funicular, the Bica has been operating since 1892 to help Lisboetas travel the 260m between the lower part of the city to the higher part without breaking a sweat. It will cost you next to nothing to travel on the Bica, and I may or may not have rang the bell three times. Try to get here super early or later in the day so you don’t have to stand in line. Let’s face it: going out to dinner with a baby is totally doable, but it can also be slightly more complicated. Depending on the kid of course. And on the restaurant. 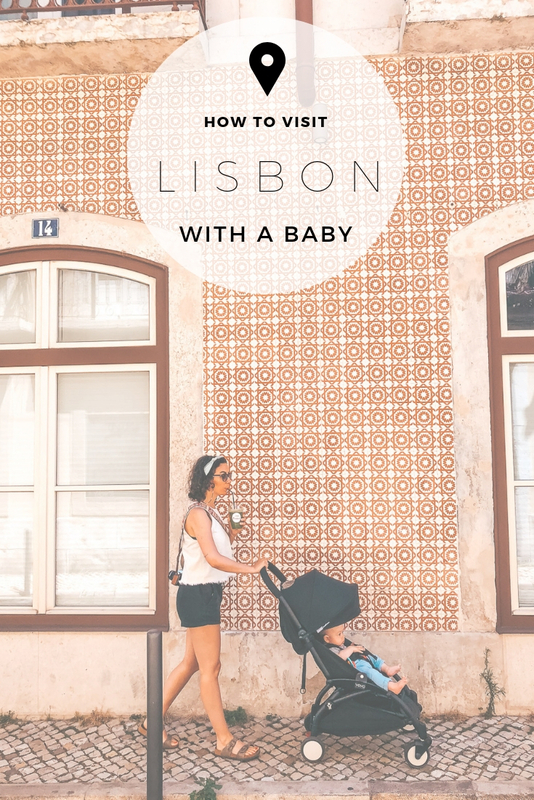 Since our days in Lisbon were pretty packed we decided to take our time for breakfast and lunch outings and have quick and early dinners so we didn’t had to deal with an exhausted and overstimulated baby in a crowded restaurant. Here are a few of our top picks. 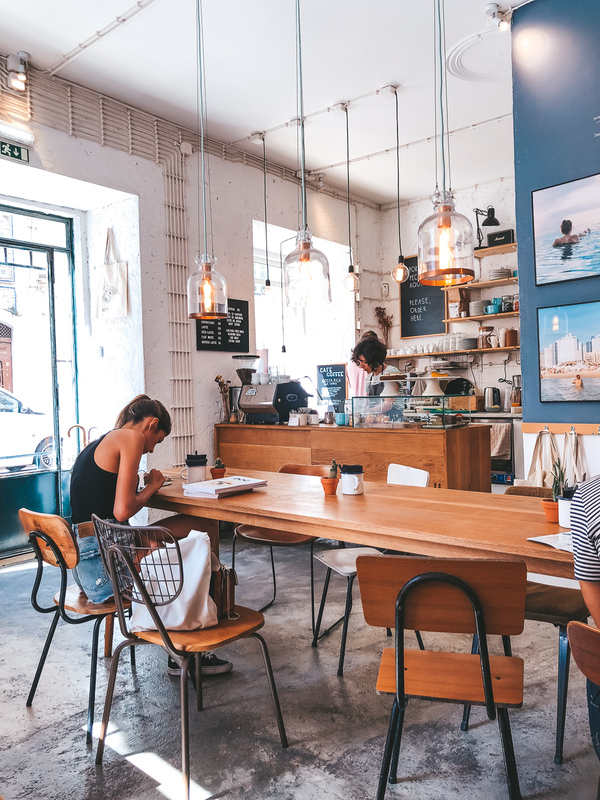 Fantastic coffee, fantastic interior, fantastic magazines. Need I say more? Oh, it was also only 30 seconds from our front door. Avo toast, smoothies, pink lattes, velvet chairs = 100% influencer proof. This Instagram worthy spot does not only deliver in terms of millennial cliches, but the food was also really good. And the staff was very in love with our kid, which means bonus points in my book. Also: don’t forget to take some pictures outside. Especially in front of that beautiful tiled building across the street. Right? 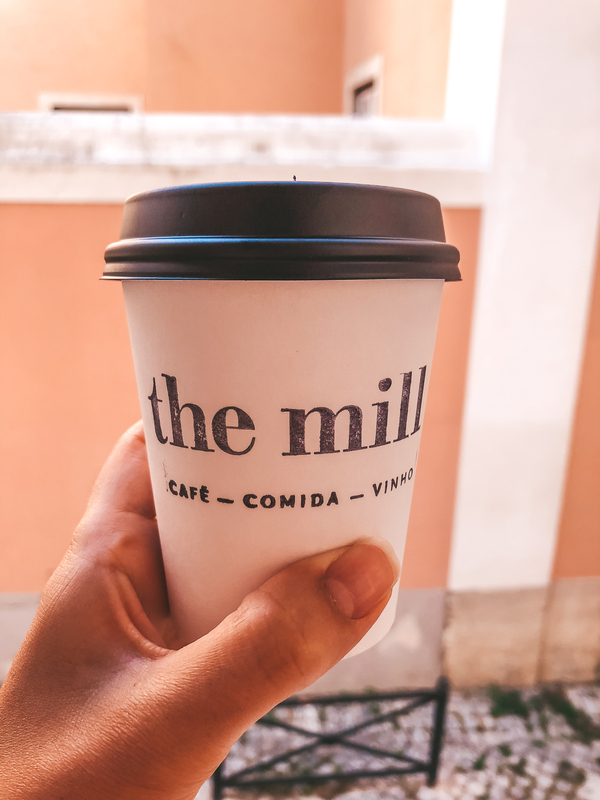 Okay, this place kinda falls in the same category as Hello, Kristof and Dear Breakfast and is as cool as coffee shops can get, plus they also serve some damn good coffee. This lovely garden cafe serves some decent organic lunch fare (although half the menu was sold out when we were there) and they brew their own kombucha if that’s your thing. The draw here is definitely the setting, although we loved the homemade bread as well. 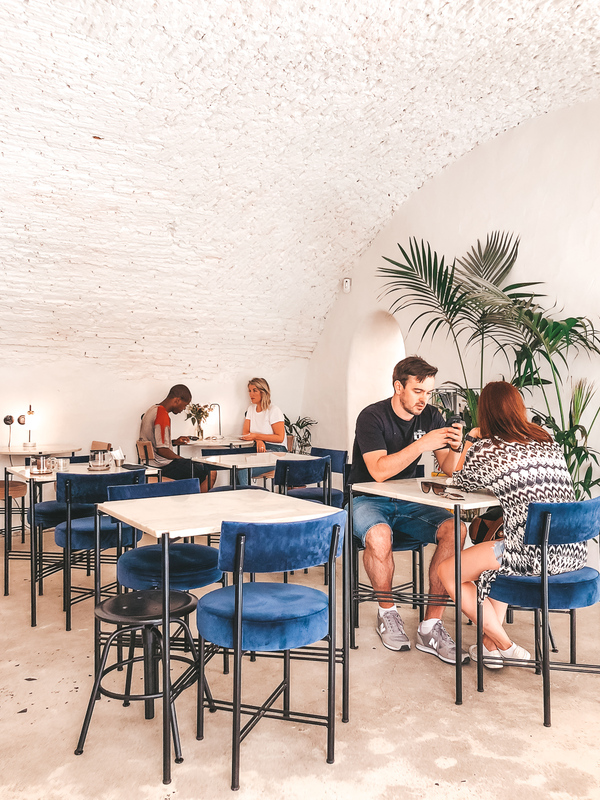 For the real, or I should say, authentic pasteis de nata experience you should head to Belém to taste the delicious soft pieces of heavenly custard filled sweets at the monastery. 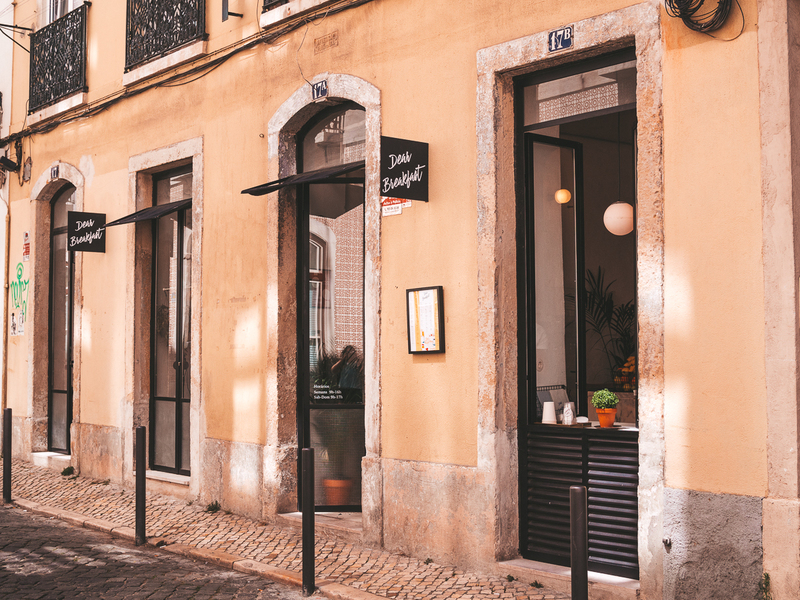 But if you don’t fancy standing in line for an hour – traveling with a kiddo and all – you should head to Manteigaria in Lisbon. And not only because the packaging is very cute. Also because their pasteis are absolutely worth those extra calories. 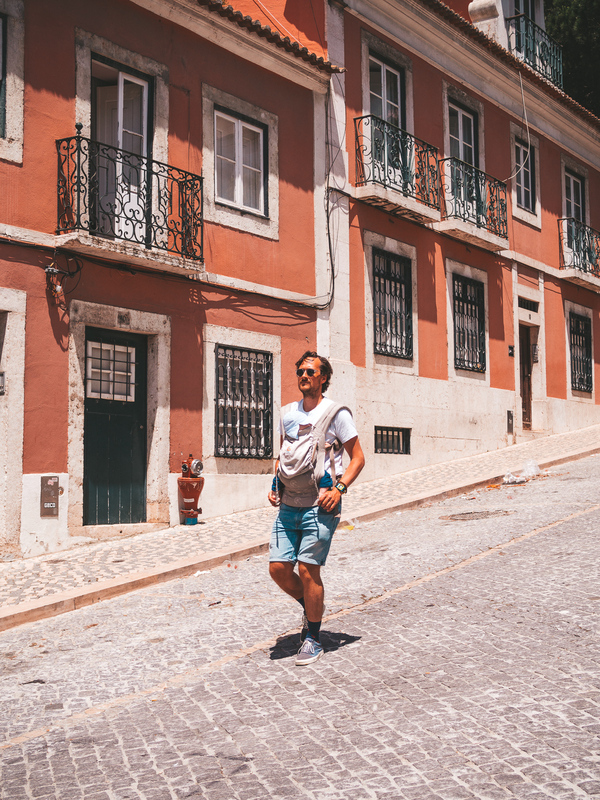 Don’t worry; all those Lisbon hills completely justify buying a few more to go. It doesn’t matter where we are in the world, I simply cannot walk past an artisanal ice cream shop. Especially if it’s very famous Italian ice cream. 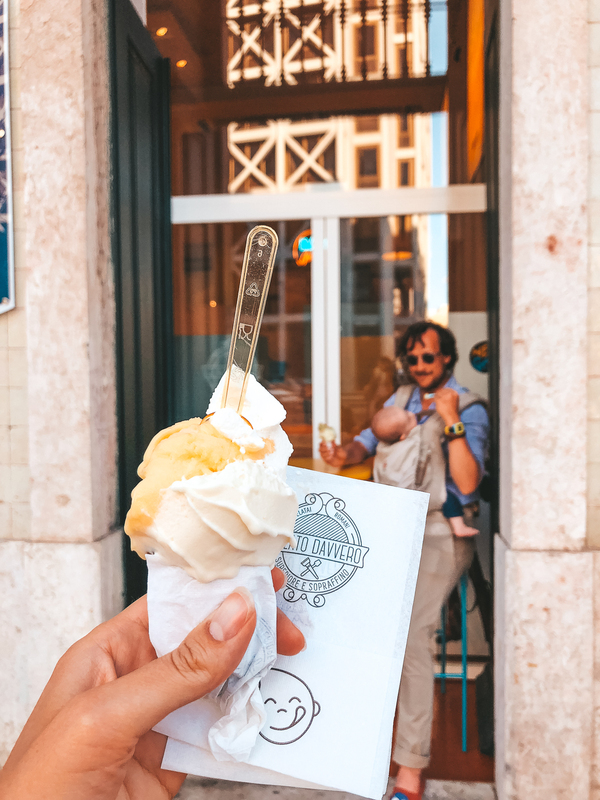 Gelato Davvero has a few locations throughout Lisbon and it’s well worth it to make your way to one of them. Luc was chilling in the carrier so we had all the time in the world to try to decide between one of the many, many, oh so many, delicious flavors. Yes, it is a little heavy on the touristy vibe but on the other hand most, if not all, of Lisbon’s best restaurants have a stall at this food market so for us it was the perfect place to taste some of Lisbon’s finest foods while our kid was shamelessly people-watching from the carrier. Confession: in the end we decided against eating the delicious ceviche at this popular restaurant since it was a little too crowded and a little too late once we got there. But! If you go here early I think it’s a really cool and child-proof place to grab a bite to eat. Next time. Because there will definitely be a next time. 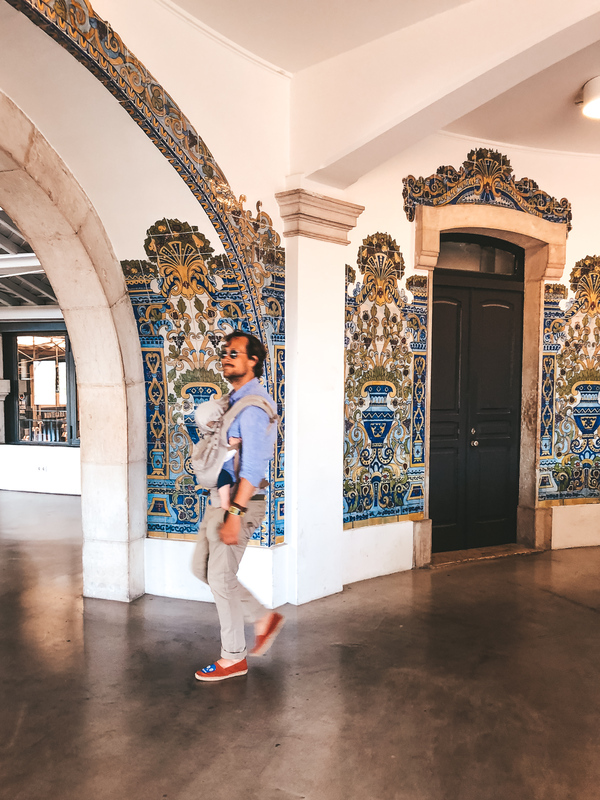 Read more about our family road trip through southern Portugal: pastel colors in Vila Nova de Milfontes, and Portugal’s best beach in Odeceixe.